Last Thursday, June 11, marked the 111th birthday of boogie woogie pioneer Clarence “Pine Top” Smith, who was born on that day in 1904. While Smith was not the first pianist to play in that style, his “Pine Top’s Boogie Woogie” is believed to be the first recorded song to use the term “boogie woogie” in its title*. Clarence Smith was born in Troy, Alabama, and got his nickname from his childhood fondness for tree-climbing. In 1928, Cow Cow Davenport recommended him to Vocalion Records, and he recorded eight sides with them in three sessions in December 1928 and January 1929. On March 15, 1929, Pine Top Smith was shot dead at the age of 24 during a fight in a dance-hall a day before he had a recording session scheduled. Whether or not the bullet was intended for him is disputed. 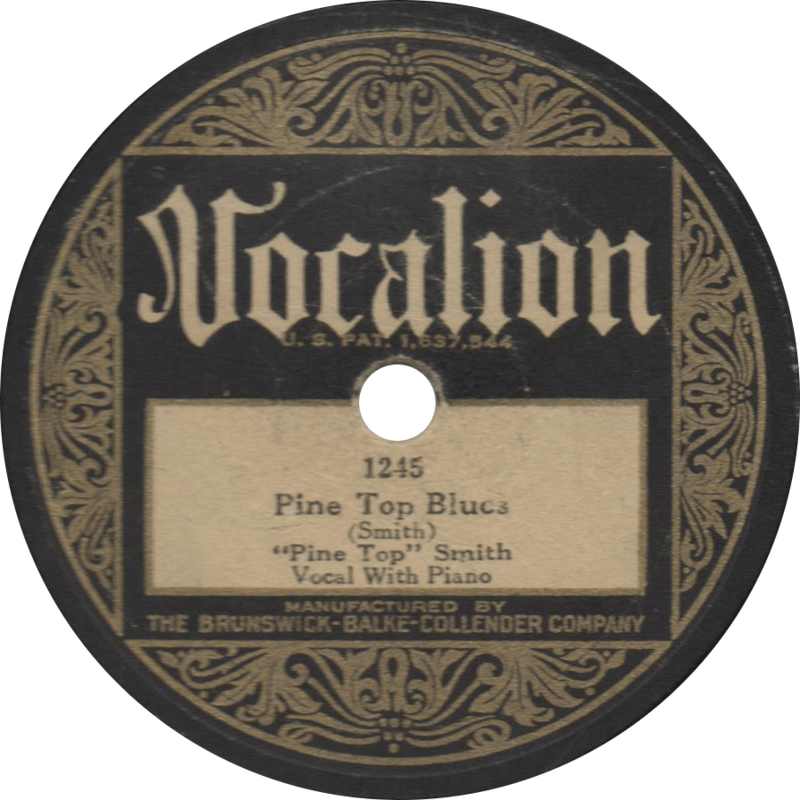 On the first side of Vocalion 1245, Pine Top Smith plays his famous “Pine Top’s Boogie Woogie”, take “A”, with his spoken instructions to dancers, recorded December 29, 1928 in Chicago, his first recording session. Just the sort of a performance that you’d hear at a 1920s rent party. Contrary to what he might have had us believe, Joe Willie “Pinetop” Perkins was not the originator of “Pine Top’s Boogie Woogie”, he got his name from playing Clarence Smith’s composition, which Smith claimed he came up with at a house-rent party in St. Louis, Missouri. It also made a hit in 1938 when it was recorded by Tommy Dorsey’s orchestra as simply “Boogie Woogie”. Please read Mr. Brad Kay’s comment for a definitive explanation. 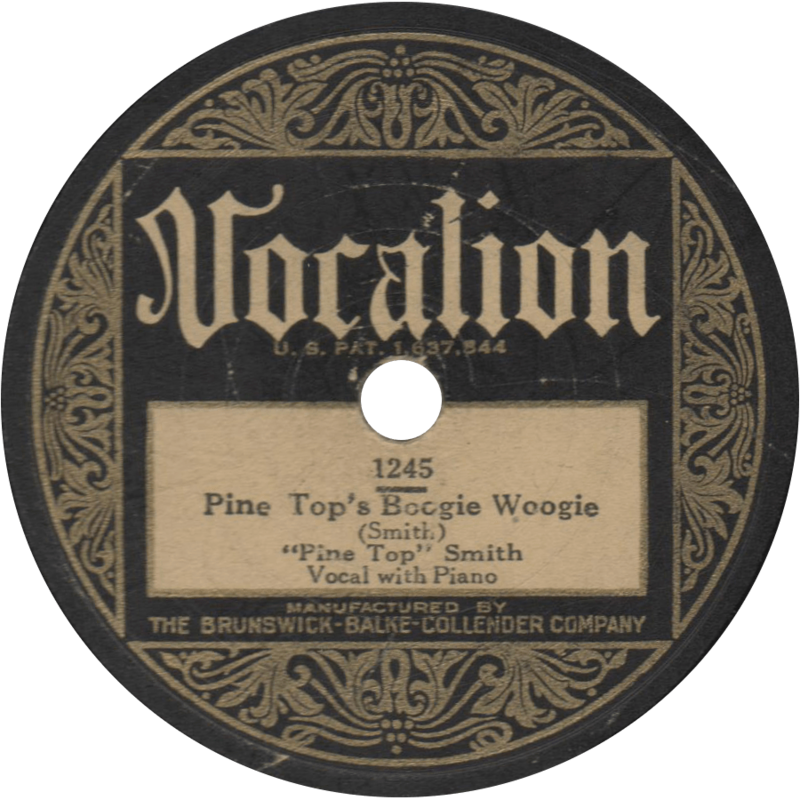 Pine Top’s Boogie Woogie, recorded December 29, 1928 by “Pine Top” Smith. On the flip, Pine Top sings on another fine boogie woogie number, “Pine Top Blues”, take “B”, recorded on the same day, which lifts some of its lyrics from other popular blues songs of the day. Pine Top Blues, recorded December 29, 1928 by “Pine Top” Smith. This entry was posted in Records and tagged 1920s, 1928, Blues, Boogie Woogie, Chicago, Piano, Pine Top Smith, Race Record, Vocalion by R. Connor Montgomery. Bookmark the permalink. What really makes Pine Top’s record a classic is his matchless, utterly superb piano playing. There is an ease and grace, total pianistic accuracy, a deep-toned quality, an infectious copasetic-ness and effortless dynamics that would be the envy of ANY pianist. It puts Pine Top in a category of his own, setting him apart from every other “Barrel House” piano player. His touch reminds me of Walter Gieseking. You have only to listen to Joe Dean’s or Speckled Red’s versions of roughly the same material to hear the difference. Plus Pine Top’s amazing singing and showmanship, of course. He must have listened closely to Bert Williams. On his record of “I’m Sober Now,” he voices six characters while playing flawless piano. On “Nobody Knows You When You’re Down and Out,” he gives out with the nitty-gritty that Bessie Smith’s only suggests. Had Pine Top Smith lived he would, at the very least, have been as great an entertainer as Fats Waller. His senseless death is one of the most regrettable in all of music history.